The path of our daily travel faces with so many peaks, such as early peak, late peak and holiday peak. And you are always a member of the army of the traveler. You are always exhausted when arriving company or home after crowded, waiting and retention. But now, the best support of urban travel - FOSJOAS single-wheeled electric unicycle, without fear of various travel peak, takes you travel in the city and to be the most cool fashion traveler. Single-wheel self-balancing electric scooter, as the name implies, is electric drive. Electric energy. It is a kind of green energy without pollution. Relatively, it is an environmental friendly alternatives for many cars on the path. Electric unicycle produced by FOSJOAS, uses lithium batteries imported from SONY, which supplies stable power, can be used several times longer than other lithium batteries. Only 1 ° electrical consumes after one hundred kilometers that can also eliminate carbon emissions for our country relying on fuel power. The lightest one of V6 and V3 of FOSJOAS self-balancing unicycle is only 9.8 kg, and the heaviest 13.7 kg. Coupled with its neat appearance, it can be completely daily portable. As long as you want, you can take any type of FOSJOAS electric scooter on bus or subway, and also be activity freely in the narrow elevator. And, of course, some lazy dad, riding a unicycle with strollers to hang out. 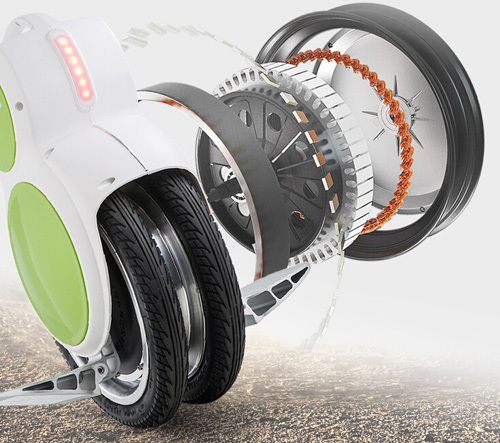 Don't think it incredible, FOSJOAS one-wheeled electric unicycle can absolutely do it. Although it is in small size, it can bear the biggest load of 120 kg. So, you also can try to ride it when shopping or dragging suitcases. FOSJOAS self-balancing unicycle occupies more than 60% of portable intelligent transportation market shares for its high cost effective. In spite of this, low price does not reduce its quality and performance, but higher performance and lower price is always the pursuit of every one of FOSJOAS core team. SONY imported lithium batteries, safe and reliable, no combustion, explosion and recycled charging 1800 times, is 3.8 times of the normal lithium battery life! Smart chip, a new upgrade debugging system, makes the system agility several times faster than normal self-balancing scooters. The unicycle goes with your heart and responses accurately.